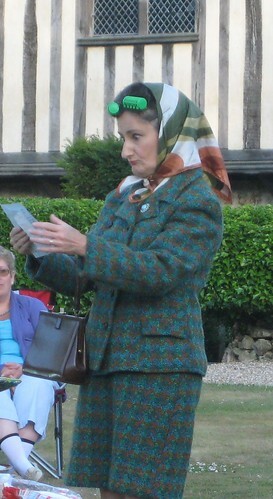 Changeling Theatre in conjunction with the Hazlitt Arts Centre have a summer Shakespeare Tour, staging The Merry Wives of Windsor at various outdoor venues in Kent, set in the 1950s with skiffle songs, and outfits of the period. 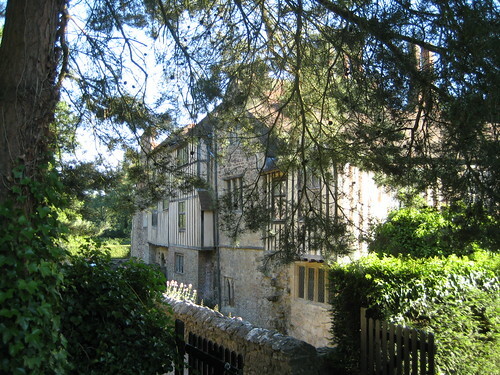 This evening the performance was held at Ightham Mote, a 14th century moated house; its historical and architectural importance may be guessed from the fact that it has a Grade 1 listed dog kennel. Sarah Finigan is Mistress Page, one of the Merry Wives, returning after an absence of TWO years. And boy did the audiences miss her. Sarah ( or as we call her, Fin) has appeared in TWELFTH NIGHT as Maria, the Nurse in ROMEO & JULIET, a witch and Lady Bracknell in MACBETH & THE IMPORTANCE OF BEING EARNEST. The last time we saw her was in THE BEGGARS OPERA/TAMING OF THE SHREW. She is going to be hilarious. Hang the trifle, woman! take the honour.